Home Spotlight	“TREZURE THE LOVE” FEATURING TONY MACK ” A MUSICIAN’S PERSPECTIVE ! For countless R&B decades, many of the world’s greatest talents are the uncelebrated musicians who have performed with many R&B Artist. One such musician is Tony Mack. Tony has a very impressionable past, an energetic present, and a prosperous future. Tony is a singer, keyboard player, producer and songwriter. For Tony Mack ” Music is his calling” and behind every singer, group etc there are those talented musicians who have helped shape the image of vocalists in the music industry, Tony, is one of those musician’s. He has cultivated his music and watched the doors open. Tony recently formed his own label and is celebrating the EP release of The FreshBand featuring “Tony Mack” and releasing his EP entitled ” Trezure The Love“.”Tony is also celebrating his new music company called Trezure Roxx Records LLC”. Tony Mack says “Music can make a difference and bring light to Social issues, but at the same time while we are being responsible we can jam to a positive message”. 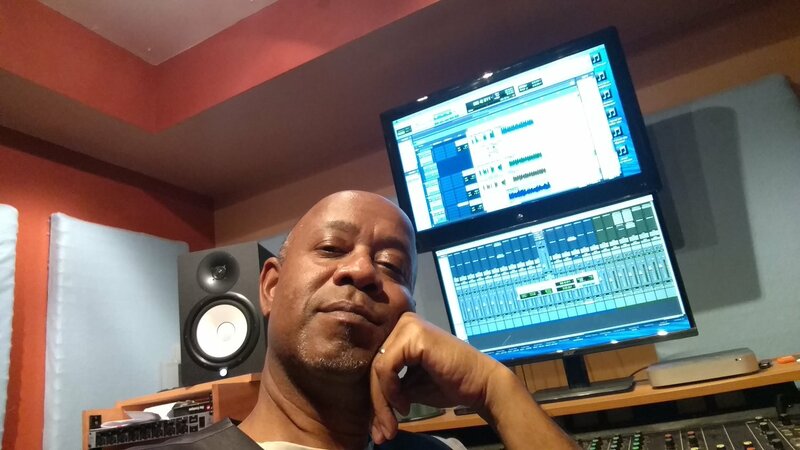 “Tony has enjoyed making music most of his life” and Backbeat R&B caught up with Tony Mack to get insight on this musician’s journey that has been filled with great recording experiences and outstanding music. BB: How did you get your start as a musician? Tony: My father was an Opera Singer in Jamaica. When we came to the states he not only sang but played acoustic guitar and tap danced. One of my earliest memories was a recording he made of “Summertime” from Gershwins Opera “Porgy and Bess.” Growing up in Hollis Queens my grandfather would play the organ every Sunday. My first gig I went on to play briefly as a 12yr old on organ with Tony Covay, the son of Don “Chain of Fools” Covay). LOTS of local bands and demo’s after that, but for me, my big break came in 81 when I got a call to go on the road with “Secret Weapon” (Must Be The Music). BB: Who were some of your major musical influences that helped you decide; this is what I want to do with my life? Tony: For me, it was Kool & The Gang and Mandrill’s “Fencewalk” that did it for me. In HS I played Alto Sax in the Senior Orchestra and Piano in the Pop Rock Workshop. I also sang in the choir as well as played the male lead in the Sophmore, Junior and Senior “Sing” (School Plays) performances. But it was something about the chemistry of KATG and the raw funkiness of Mandrill that made me say, THIS is what I want to do. BB: What genre of music do you consider your work to be? Tony: My work entails traditional R & B. Dance music with that heavy funk overtone, but still innovative and new enough to separate from the pack. I grew up listening and working with some of the heavy hitters in the field. Freddie Jackson, Melba Moore, Lilo Thomas, Babyface, Leon Sylvers, the list goes on. I feel there’s a legacy that must live on. BB: Besides R&B, do you also play any other genre of music? Please tell us(what other genres) with whom? Tony: Before I got drafted into dance music, all the Kats back in Hollis lived by the code of the cosmos. For me, it was Jeff Lorber, Chick, of course, Herbie, Jean-Luc Ponty, YellowJackets. This genre (Fusion) was not only challenging and growth inducing for me but it gave music and jamming with other kats meaning. I remember vividly the days of us warming up to Fusion Juice (Jeff Lorber) and of course “Spain” by Chick Corea. It gave me IMMENSE joy telling Jeff this years later! BB: Can you tell us some of the R&B groups you played/toured with over the years? Tony: Whoa. I’m PROBABLY gonna leave some people out, but here it goes. Of course Secret Weapon (Must Be The Music), Shannon (Let The Music Play) Freddie Jackson, Melba Moore,Kurtis Blow, GrandMaster Flash, The Fat Boys (Gold single from that), Fearless Four (Problems of The World), Crown Heights Affair (Struck Gold Album), The Strikers, Unlimited Touch, Oran “Juice” Jones, Sweety “G” (Games People Play) The Mercedes Ladies, Jekyll & Hyde (Before Andre Harrell went to I think Uptown Records) Spyder D, Elai Tubo, Julio Herrera, Glenn Gibson, Paul Fraoley, Kevin Harrington, Camille Gainer Jones, Darnell Williams (Jesse from All My Children, which led to a spot on the show playing for him when he sang at The Steampit), Davy DMX, Output (CBS/Assoc label), forgive me if I cannot recall the rest. They’ll probably come back to me later. BB: What is your advice on touring? Tony: Know your material. Get plenty of rest and buckle in because going city to city is no joke. The Freddie Jackson/Melba Moore tour was probably the most grueling experience I’d been through. Freddie singles were fired hot and Melba will ALWAYS be hot so we performed constantly. BB: What advice would you give anyone wanting to go into this business? Negatives/ Positives etc? Tony: Have your team in place (Management, Accountant, Lawyer) because ALWAYS remember, the music BUSINESS. Also work hard, but remember to have fun. BB: Do you think the old school R&B is slowly dying out? BB: How do you handle mistakes during a live performance if and when it has happened? Tony: Things happen, but the bottom line is, we are here for those who support us and our music, so our all is what we give. Mistakes? Uhhh, yeah, I’ve had a few, but I’ve been able to live through them. I remember years back going to a Prince concert here in Philly. Right? So with all you do in life there comes a moment when you’re…… a fan!!!! And Prince??? Uhhhh…fan…. anyway. Dude’s rocking… right? But throughout his AMAZING show, performance, vocals, you name it….yeah, he dropped the mike a couple of times. Did it change how loud I was screaming? Uhhhh… no. Maybe it’s because it was the dude, maybe not. The show must go on…..
BB: As a musician who has toured with the greatest of old school groups, are there any favorite Artist that you love to perform with and why? Tony: The Kats I’ve grown up with have all went on to play with the Kreme of the Krop, can’t drop all the names on this, but when we come back together it’s like magic because we have so much history. BB: How do you think R&B music is doing these days, do you get a lot of tours for old school gigs? BB: Where are you touring next and with whom? Tony: By the time this gets out I should have signed my major distribution deal but I’m under a confidentiality clause until then. But I plan to be in the ATL this summer…but you’ll have to look out for FreshBand featuring Tony Mack. Y’mein?? BB: So what’s next for you in the music industry(New Cd’s, Albums), will you be transitioning into another genre of music? Tony: My label Trezure Roxx Records is finishing up work on the Crown Heights Affair featuring The Legendary William Anderson single “Mary, Mary.” All I can say is FIYAH. After that going back in to finish work on Shannel “B” Baynard daughter of Legendary Crown Heights Affair trumpet player James “Ajax” Baynard, of course, my EP FreshBand featuring Tony Mack “Trezure the love…” followed by a gospel EP. Can’t WAIT for THAT!!!! And I have a couple of jazz fusion tracks I’m toying with as well as…… nahhhhh… that’s all I’m giving up right now!!!! Haaaaaaaaa!!!!! Select a page and create a visual link to it.Learn more. “BACK DOWN MEMORY LANE” WITH MINNIE RIPERTON ! Well written Belinda. Keep the stories alive sis….